Why are so many of us consumed by our desire for food? Why can't we stop eating, or stop thinking about eating? In her thought-provoking new book, Mika Brzezinski cuts through the blame and shame surrounding the obesity epidemic in America, and shares insights from notable personalities and top researchers about how we got here, and how we can take control of our eating habits. Along the way she reveals her personal battle with food, and the journey she and her close friend Diane have taken to change their weight, and more importantly, their attitude toward food. The New York Times bestselling author and co-host of MSNBC's Morning Joe shares the story of her own struggle with food, hoping to inspire us all to begin the journey toward healthy eating. Mika Brzezinski is at war against obesity. On Morning Joe, she is often so adamant about improving America's eating habits that some people have dubbed her "the food Nazi." What they don't know is that Mika wages a personal fight against unhealthy eating habits every day, and in this book, she describes her history of food obsession and distorted body image, and her lifelong struggle to be thin. She believes it's time we all learned to stop blaming ourselves, and each other, and look at the real culprits -- the food we eat and our addiction to it. Mika feels the only way to do this is to break through the walls of silence and shame we've built around obesity and food obsessions. She believes we need to talk openly about how our country became overweight, and what we can do to turn the corner and step firmly onto the path of health. So Mika made a deal with her very close friend Diane: they would work together on this book and on their personal goals, to help Diane drop 75 pounds and to break Mika's obsession with staying superthin. As she did in her bestseller Knowing Your Value, Mika has packed each chapter with insights from notable people in medicine, health, business, the arts, and politics. 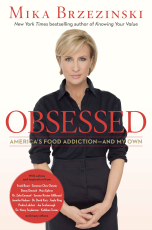 Singer Jennifer Hudson, the late writer and director Nora Ephron, TV host Gayle King, New Jersey governor Chris Christie, and many others open up to Mika about their own challenges and what works for them when it comes to food and diet. It's time we stopped whispering the F-word ("fat") the way we used to shun the C-word ("cancer"). This book -- with its trademark Brzezinski smarts, honesty, and courage -- launches us into a no-holds-barred conversation with family and friends, in schools and kitchens, in Congress and the food industry, to help us all find ways to tackle one of the biggest problems standing between us and a healthier America.